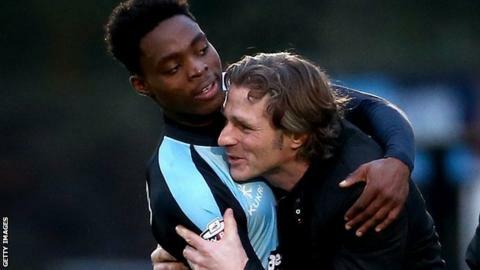 Fred Onyedinma's second-half goal at Bury rescued a point for Wycombe and kept them top of League Two. In a scrappy game, Danny Mayor did enough to bundle home the opening goal from a Ryan Lowe cross after Alfie Mawson failed to clear the danger. Wycombe's Aaron Amadi-Holloway had an effort saved before Onyedinma met a Joe Jacobson cross to fire the equaliser past Shakers goalkeeper Nick Pope. Danny Rose had a chance to win it for Bury, but volleyed off target late on. "People say that Wycombe would come here and try to dominate you, but my team don't know how to get dominated. "I was very happy with the first half performance and how we controlled the game and dominated the game and created chances. "Second half, it was tin helmet time and we've withstood everything Wycombe threw at us, and the referee's balanced it out - not too sure if he wanted a draw because he thought he might have made a mistake by playing the game. "As a team, the referees haven't organised themselves in the best positions to give a free-kick (for a foul) on Adam El-Abd and then the boy who scored used his hand to push the ball into the box." "I don't come to a place like Bury expecting to get three points, but after the performance today I'm surprised we haven't. "We started sloppy. For the first 20 minutes we weren't in the game, and we've gifted them a goal. "We've shown great character again to come from behind. "I'm not sure this game should have gone ahead if I am being totally honest, the pitch is terrible!" Match ends, Bury 1, Wycombe Wanderers 1. Second Half ends, Bury 1, Wycombe Wanderers 1. Corner, Wycombe Wanderers. Conceded by Craig Jones. Corner, Wycombe Wanderers. Conceded by Andrew Tutte. Attempt missed. Danny Rose (Bury) right footed shot from the centre of the box is too high. Foul by Peter Murphy (Wycombe Wanderers). Corner, Bury. Conceded by Aaron Pierre. Attempt saved. Aaron Pierre (Wycombe Wanderers) left footed shot from the centre of the box is saved in the bottom right corner. Corner, Wycombe Wanderers. Conceded by Chris Hussey. Adam El-Abd (Bury) wins a free kick on the right wing. Goal! Bury 1, Wycombe Wanderers 1. Fred Onyedinma (Wycombe Wanderers) left footed shot from the centre of the box to the top left corner. Attempt missed. Daniel Nardiello (Bury) left footed shot from the left side of the box is close, but misses to the left. Substitution, Bury. Daniel Nardiello replaces Danny Mayor. Corner, Wycombe Wanderers. Conceded by Nick Pope. Attempt saved. Aaron Holloway (Wycombe Wanderers) header from the centre of the box is saved in the bottom right corner. Second Half begins Bury 1, Wycombe Wanderers 0. First Half ends, Bury 1, Wycombe Wanderers 0. Corner, Wycombe Wanderers. Conceded by Adam El-Abd. Attempt blocked. Alfie Mawson (Wycombe Wanderers) right footed shot from outside the box is blocked.